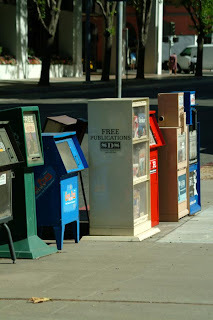 ..:recycled minds:..: Off the Record: The Collapse of Traditional Journalism? Off the Record: The Collapse of Traditional Journalism? Wicker's thoughts, written only seven years ago, demonstrate how quickly the Communications Revolution has indeed changed the state of journalism. While much reporting lately has focused on the bankruptcy or closing of both major and minor daily newspapers, less has been focused on what these changes mean for journalism itself, it's role in a democratic society and it's role as recorder for future scholars and historians. Objectivity aside, journalism's function is so large, it's easy to take for granted. So this is where we stand: much of local and state government, whole federal departments and agencies, American activities around the world, the world itself--vast areas of great public concern--are either neglected or on the verge of neglect. Politicians and administrators will work increasingly without independent scrutiny and without public accountability. We are entering historically uncharted territory in America, a country that from its founding has valued the press not merely as a watchdog but as the essential nurturer of an informed citizenry. The collapse of journalism and the democratic infrastructure it sustains is not a development that anyone, except perhaps corrupt politicians and the interests they serve, looks forward to. Such a crisis demands solutions equal to the task. So what are they? It's not like this is a sudden event - the major dailies have been under consolidation efforts for years now, and I would argue stopped doing the things you mentioned they do when they lost their independence. The shift to the internet comes with its own problems, but that's where we've been headed, and it looks like that's where we'll continue to go. It is, after all, a place where all of the people can be journalists - the ultimate democratization of the news. Yes, all of the people can be journalists, but *will* any of the people be journalists? In the past, being a journalist was a source of income. So far, no newspaper has been able to exist online independent of their print counterpart -- 90% of the revenue for newspapers comes from their print advertising. If print ceases, and online has not been sustainable, then who pays the writers? this is exactly what is wrong with the 'news industry' - it's all about the profit margin. there needs to be a conceptual shift away from doing things for money to doing things because they need to be done. reporting and sharing important news and events is something that needs to be done. otherwise we all might as well fall in line to the marching orders.